Email Wendy Payne with questions. The Service Committee is excited to announce that our last service project for the year will be to collect shoeboxes for Operation Christmas. Operations Christmas is a project through Samaritan’s Purse. It is an organization that helps people out during times of crisis like when a tornado, flood, hunger, or hurricane in the U.S. and around the world. They also help countries build schools, provide medical needs, and obtain clean drinking water. The boxes also spread the word of God, love, and support for all those in need. Operation Christmas shoeboxes can be filled anytime of the year, but boxes are sent out in late November. Our school does a great deal to help those in Rome and surrounding area at that time. We want to pack boxes now and send them to the storage area until November when they will be delivered to children who may have never received a toy, school supplies, and basic hygiene needs. If your family decides to support the project, you can print off the packing list below. We are going to pack boxes for kids ages 5-9. Your family can decide if they want to pack a box for a boy or a girl. Then your family will go to the store and buy the supplies for your box. You can also include pictures, drawings and a note of love and support for the child. We have boxes here at school that you can fill or you can use a shoebox from home. If you are interested in paying for shipping or want follow where your box goes, you can go to the link below and pay $9 dollars and print off a packing label. Put the label on your box, when it is delivered it will let you know where your box went. Fill the shoebox with the items you brought and bring the box into you homeroom teacher. We will collect boxes from April 29th through May 8th. On May 8th, the Service Committee will go through the boxes and make sure they are packed correctly. The students that bring in a box will get a dress down day on May 9th. Thank you for supporting this project and helping kids out around the world. Juniors and junior parents - If you have not had the chance to contribute to prom preparation, you still have a chance! We will need help Friday, April 26th in the Huffman and especially on Sunday, April 28th at 4:00PM in the Huffman for clean up. Many hands make light work so we look forward to seeing you there! Join us Monday, April 29 @ 8:15 a.m. at Thatcher Hall's Yancey Library for the last Tiger Pride meeting of the school year. The slate for next year's board will be approved and we will provide details about upcoming events. There will also be a time for feedback and discussion. All are invited and encouraged to attend. Coffee will be provided. Applications for Y Cabinet and Student Council are available to pick up in the Student Life Office. These applications will be due back to Student Life on Monday, April 29! Our admission team is looking for great students and we need your help! Won't you invite a prospective Darlington family to be our guest at an upcoming Food for Thought lunch near you? We know people are busy, so we've decided to make it as easy as possible for families to learn more about Darlington School. Attendees will enjoy a casual visit with current parents, administrators and admission; learn about options for tuition affordability; and discover why Darlington students graduate with the confidence, connections, and compassion they need to succeed in college and their career, and be meaningful contributors to the greater good. To sign up, guests should simply click here to choose the event they plan to attend and fill out a brief registration form. Please help us spread the word! Final Prom Information - Decorating, Ticket Sales, T-shirts! Purple Tie Planning Meeting-Join us! We still need great members in the Darlington community to join our wonderful Purple Tie volunteer team! Would you like to help procure items for the auction, sell raffle tickets or assist with event details? Join us at our next meeting to see how you can help. Email purpletie@darlingtonschool if you can't attend, but would still like to help. Attention rising 6th, 7th, and 8th graders interested in cheerleading for the 2019-2020 school year. Please note the information below and see Ms. Exford or Mrs. Rogers with any questions. Tryout Clinic will be on Monday, May 6 and Tuesday May 7 from 2:45 - 4:00 pm. Girls can choose to attend one or both days of clinic. Tryouts will be held Wednesday, May 8 at 2:45. All clinic days and tryouts will take place in Thatcher Hall commons. This will be the only tryouts for middle school cheerleading for the 2019-2020 school year. Please make sure if you are interested in cheering for football, basketball or both that you are in attendance at tryouts as there will not be another one this year. We will be hosting tryouts for the fall girls MS volleyball team starting May 6th thru May 8th from 2:35 to 4 pm in the Morgan Pavilion next to Thatcher Hall. If you are a current student and have any interest, you need to be in attendance for tryouts. Current 5th graders interested will report to practice immediately following dismissal from their class at 3:15. Girls will be expected to be in athletic clothing and volleyball shoes or sneakers. Please communicate with Mr. Eberhart with questions. I look forward to seeing a large group out there and ready to defend our back to back FCAA Championships. Practices will start in early August before school starts. HIGH SCHOOL LEADERSHIP ROME is a year long leadership training program offered by the Rome/Floyd Chamber and an excellent opportunity for interested students to learn and interact with many fields of business and business leaders in the Rome area. The time commitment for all eleven sessions is substantial so please make sure you are flexible enough in your schedule to accommodate these meetings before you apply. The actual schedule of meetings is available in the application literature. The fillable application is attached below in either a pdf. or a word document. All applications must be submitted by email to Mrs. Evans devans@darlingtonschool.org no later than Thursday, May 2nd, so time is of the essence. Please see Mrs. Evans in the Student Life Office if you have any questions. Ryan Matherly, the Youth and College Pastor at Pleasant Valley North Baptist Church, has a service opportunity for any Darlington Students who would be interested in gaining service hours. This summer PVN is again hosting a one-week WinShape Camp for students grades 1- 8 sponsored by Chick Fil-a and are expecting over 500 kids participating. They need roughly 30-40 High School volunteers. Doctors will sign the physical form once the student has completed all stations and upload it onto the student’s enrollment site. 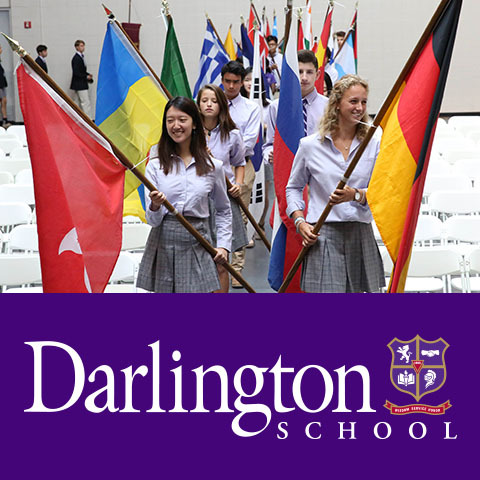 The cost of the physical is free for students who participate in a Darlington athletic program. Students who are not involved in an athletic program should plan to pay a $25 fee (resident student fees will be billed to the Parent Account). Day students should bring a check made payable to Darlington School. In addition to physicals, we are offering EKG Screenings for a separate charge of $40. All EKGs must be paid by students at the time of service with cash or check made payable to Floyd Medical Center (residential students may white slip). 2. Call Darlington’s Health Center at 706-236-0428 to make an appointment for the EKG. The screening will be scheduled on the same night as the physicals, so please be sure to specify which night your student will attend. Please continue to check the parent section of the website for further information regarding the next steps for your student's online registration. Girls ages 4-12 are invited to jump into the fun of cheerleading this summer! Campers will learn lots of new cheers, perform age-appropriate stunts, improve technique, and build your repertoire of moves and formations. Camp is June 3-7 from 9:00-12:00 at Huffman Athletic Center. Click here to register and for more information. Email Wendy Payne or Bebe Cline with questions. If your student is interested in playing middle school football please make plans to attend a brief parent meeting on Tuesday, April 30 in the Joanne G Yancey Library at Thatcher Hall. Spring football practice is May 6-May 16, Monday thru Thursday from 4:00-5:30 pm in shorts and t-shirts. The student council is sponsoring a dance for 7th and 8th grade students. Please save the date for Friday, April 26 from 8:00-9:30 pm. The dance will be held at Thatcher Hall with lots of music, food and fun. Come and join us! Register online for the MAKER CHALLENGE Camp and our All-New NATURE NUTS Camp. Enrollment is limited, so please act now! The attached table has information and dates for application deadlines for Discipline Committee, Honor Council, Student Council, Head Prefects, and Y-Cabinet. 11th Annual Tri for the Kids Youth Tri is COMING SOON! Come join the fun for the 11th annual TFTK race held on our campus and benefitting The Boys and Girls Clubs of NW GA.
WE WILL HAVE SOME PRACTICES BEFORE THE BIG DAY TO HELP YOU ALL GET READY! DATES TO COME AFTER SPRING BREAK. E.L. Wright Academic Awards Assembly – Morris Chapel 9:15 a.m.
Graduation Rehearsal, Darlington Campus – chapel lawn and Huffman Center, 9:00 a.m. – 12:00 p.m. Exemptions announced and college information wrap-up. Attendance for all seniors at rehearsals is required. Morning Exams - 8:15 a.m.; Afternoon Exams - 1:00 p.m.
Casual Dress, those who wish to swim in the pool, bring a suit and towel. Transportation provided for boarding students details to follow. Zelle Blackbox Theater, 7:00 p.m. Honors Day, Morris Chapel, 1:30 p.m.
Baccalaureate Service, Morris Chapel, 7:00 p.m. Photographer RuthAnne Anderson will take group photos on the library steps beginning at 8:00 a.m. Groups will include: entire class photo, international students, 4-year boarding, PK-12 Students, etc. Seniors line up at 9:00 a.m. on the pathway to Home on the Hill. Luncheon for International students, their families, and their guests, Dodd Banquet Room, immediately following Commencement. More information will be sent via email to International families in April. The Floyd County Board of Education will offer Drivers Education this summer for the first two weeks in June. Students may choose week 1 or week 2. Attached is the information letter and registration form. Please read the information letter carefully. If you are interested in taking the class, please bring your completed registration form and check (or cash) made out to FCBOE to the Student Life Office. Please contact Denise Evans in the Student Life Office if you have any questions.